A sheep is an individual of any of the eight woolly mammal species that comprise the genus Ovis, part of the goat antelope subfamily. All the sheep are bovids (members of the family Bovidae) and ruminants, meaning they chew cud. The domestic sheep is thought to be descended from the wild mouflon of central and southwest Asia. Members of the genus are highly gregarious. Female sheep are called ewes, males are called rams (or "bucks") and young sheep are called lambs. The adjective applying to sheep is ovine and the collective terms for sheep are flock and mob. The term herd is also occasionally used in this sense. Sheep are usually stockier than other bovines and some have horns which are more divergent than those of goats. Sheep have scent glands on the face and hind feet. Communication through the scent glands is not well understood but is thought to be important for sexual signaling. Males can smell females which are fertile and ready to mate, and rams mark their territories by rubbing scent on to rocks. They have a four-chambered stomach which plays a vital role in digesting, regurgitating, and re-digesting food. Domestic sheep are important for their wool, milk, and meat (which is called mutton or lamb). The most populous species of sheep is the domestic sheep, the largest populations of which are found in China and Australia. 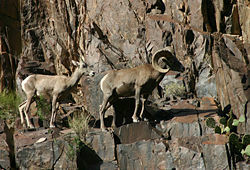 Wild sheep mostly found in hilly or mountainous habitats. They are fairly small compared to other ungulates; in most species adults weigh less than 100 kg (220 lb). Their diet consists mainly of grasses, as well as other plants and lichens. Like other bovids their digestive system enables them to digest and live on low-quality, rough plant materials. Sheep conserve water well and can live in fairly dry environments. Their bodies are covered by a coat of thick hair to protect them from cold. The coat contains long, stiff hairs, called kemps, and a short woolly undercoat, called fleece, which grows in fall and is shed in spring. Wild sheep are social animals and live in groups, called flocks. This helps them to avoid predators and also helps them stay warm in bad weather by huddling together. Flocks of sheep need to keep moving to find new grazing areas and more favorable climate as the seasons change. In each flock there is a sheep, usually a mature ram, which the others follow as a leader. In wild sheep both rams and ewes have horns, with the rams' being much larger. The horns of a mature bighorn ram can weigh 14 kg (30 lb), as much as the rest of its bones put together. Rams use their horns to fight with each other for dominance and for the right to mate with females. In most cases they do not injure each other because they hit each other head to head and their curved horns do not strike each other's bodies. They are also protected by having very thick skin and a double-layered skull. This page was last modified on 24 July 2014, at 17:14.